“We have to be the check on their power. If we don’t hold them accountable, who will?” – Tom Hanks as Ben Bradlee, editor of The Washington Post in “The Post” (2017). However, what do we tell young people who are pondering a future as a reporter? Choosing a journalism major might mean taking flak from parents who encourage college-bound kids to rethink their studies and instead pursue more promising careers in engineering, healthcare or IT. Landing a reporting job is a dead-end road to a low pay, high stress career, they might say. Fortunately, Washington state took a bold step last month to show its support of student journalists and their free speech rights. On March 21, Gov. 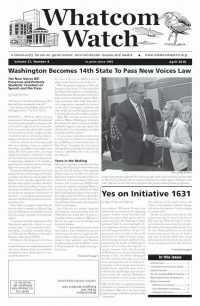 Jay Inslee signed into law a bill that states student journalists should be free from school censorship as long as their reporting is not libelous or illegal and would not disrupt the educational environment of the school — essentially the same parameters and responsibilities that professional journalists work under. Dana Smith, an English teacher who advises the school newspaper at Sehome High School in Bellingham, was thrilled to hear of the bill’s passage, especially with bipartisan support. “Learning to ethically exercise one’s First Amendment rights isn’t a liberal or a conservative value — it’s an American value,” said Smith, a Certified Journalism Educator (CJE) with the Washington Journalism Education Association (WJEA). On March 2, the bill passed in the House by a vote of 91 to 6; on March 5, the bill passed in the Senate by a vote of 45 to 4. With the governor’s signing in 2018, the Evergreen State joined 13 other states that have New Voices legislation, modeled after a North Dakota law that was approved in 2015 with unanimous bipartisan support. Washington state’s law, which makes high school and college editors responsible for content in the school newspaper, yearbook and other media, also provides legal protections for faculty advisers and journalism teachers. In some cases, journalism teachers fear for their jobs in retaliation for overseeing the publishing of controversial topics, so New Voices “recognizes the role of good advising while protecting both faculty and students,” added Watt, who is also a media law instructor. After years of gaining movement and then stalling, the bill finally got a boost when state Sen. Joe Fain (R–Auburn, 47th legislative district) took it on. In 2016, Fain met with high school students in his district who convinced him of the importance of their press freedom. Fain co-sponsored SB5064 with several other legislators including Whatcom County state Sen. Kevin Ranker (D, Orcas Island, 40th legislative district), who voted in favor. Rep. Luanne Van Werven (R-Lynden, 42nd legislative district) voted in favor; Sen. Doug Ericksen (R-Ferndale, 42nd legislative district) voted against. Fern Valentine is a stalwart supporter advocating for such protections since the 1990s when she retired after 19 years as a journalism educator at Auburn High School. She was also eager to see the bill approved during her lifetime. “I think it is particularly important today that students learn firsthand the process of presenting the news in a legal and ethical way while covering stories of particular interest to their audience,” said Valentine, an active volunteer with the WJEA, “I want it off my bucket list” she added, referring to the new law. Back at the nation’s capital, Student Press Law Center (SPLC) staff members cheered as they added Washington to its list of states with New Voices laws —14 total to date (the 13 other states are: Arkansas, California, Colorado, Illinois, Iowa, Kansas, Maryland, Massachusetts, Nevada, North Dakota, Oregon, Rhode Island and Vermont). “We need young people to be asking hard questions and to be holding power accountable in the best possible ways,” SPLC Executive Director Hadar Harris said. The SPLC has been supporting students since it was established in 1974. Every year, attorneys at the nonprofit field more than 2,000 calls from student editors handling censorship. In fact, the SPLC said that calls to its legal hotline with questions about censorship increased by about 350 percent in the 15 years after the U.S. Supreme Court decided Hazelwood v. Kuhlmeier. Students were calling to report that their principal was pulling a story, or that administrators were controlling the headlines. In Hazelwood, the Court decided in favor of administrators at Hazelwood East High School in Missouri, who insisted that principals and others “in charge” should have the right to approve or nix stories in school newspapers, yearbooks and other student-sponsored media. Interestingly, this decision eroded the rights students had been afforded years prior in Tinker v. Des Moines (1969), when the Court had ruled in favor of students who wore black armbands to school show their protest to the US government’s handling of the Vietnam War. Since the Hazelwood case came down 30 years ago, free press advocates and supporters of New Voices legislation claim that the decision negatively affected student media, even having a chilling effect on student editors covering potentially controversial stories. Also, advocates say administrators sometimes go “far beyond ‘legitimate pedagogical concerns’ when it comes to censorship,” according to the National Council of Teachers of English (NCTE), which passed a resolution in February 2017 urging state legislators to make more laws protecting student speech. Now that Washington has a show of support on the books for student journalists, the question remains: are young reporters ready to exercise their free speech rights? Thankfully, the answer seems to be Yes! as we see students stepping up to the plate. A senior, Morgan awaits responses from the journalism departments at University of Washington and the City University of New York. Along with classmate Taylor Hunzeker, Morgan serves as co-editor-in-chief of Tomatalk, Kamiakin High School’s newspaper, where she’s covered a variety of challenging topics — including the sudden death of a classmate and her district’s policy on Advanced Placement classes. A few months ago, she took a day off from school to drive four hours (with her parents) to Olympia. Morgan joined at least a dozen fellow press freedom advocates to speak in favor of SB5064. “Now more than ever, student journalists need their full First Amendment rights,” Morgan said in her prepared statement to members of the House Judiciary Committee on Feb. 14. “We live in a country that values press so much that we have an amendment in the constitution protecting it. Why are we censoring the next generation of journalists?” Morgan added. With the law planned to go into effect this summer, administrators, teachers, advisers and students are preparing to educate themselves on the policy. 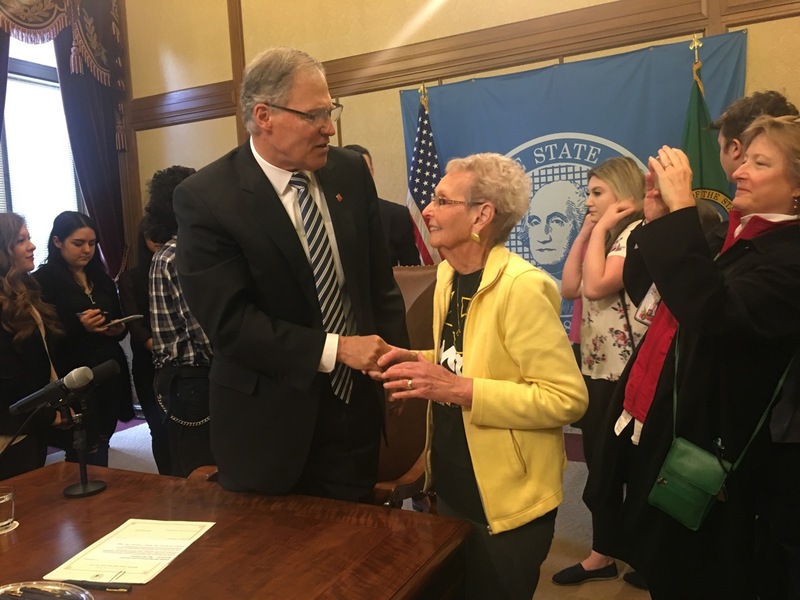 Dr. Susan Enfield, Superintendent of Highline Public Schools in Burien, Washington, a strong supporter who was attending the governor’s signing on March 21, said she will work with the WJEA to raise awareness of New Voices. “[Students] need to learn that words have consequences … and an impact. Denying them their right to freedom of the press is foolish and it does more harm than good,” Enfield said in a recent interview when the bill was moving through legislative committees.